A family of four from London have relocated to the other side of the country to open a rum distillery in West Lothian. Mattuga Distillers — founded by husband and wife team Paul and Janice Rutasikwa — is preparing to start production at its new £100,000 facility in Livingston, West Lothian. The distillery is equipped with two 200 litre copper pot stills, capable of producing 50,000 litres of artisanal rum in its first year; the equivalent of 2 million single rum serves. The family – which includes their two young daughters – relocated from London to Livingston in July 2017. 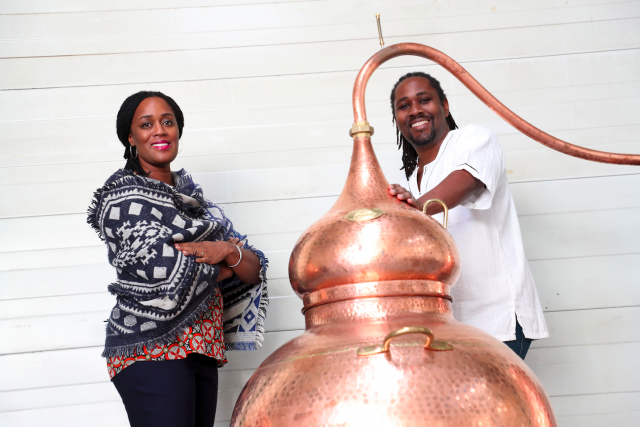 Mattuga, which has been small batch distilled in England since 2015 and sold on specialist online retailers like the Whiskey Exchange, pays homage to Paul and Jacine’s Jamaican and Ugandan backgrounds. Janice said that their rum carried a “signature smokey aspect” comparable to Scotch whisky. The Rutasikwa’s began considering a move while Paul was enrolled in a brewing and distilling masters at Heriot-Watt University in Edinburgh. The couple currently make two versions of the dark spirit; Mattuga Golden and Mattuga Spiced. The spiced rum is using sugar cane molasses sourced from east Africa, alongside a blend of black tea, ginger, cloves, vanilla, cardamom and cinnamon.